The last time the Nets played the Timberwolves they lost their starting Forward Caris LeVert to a leg injury and subsequently lost the game. Entering their second meeting with the Wolves could either be a game of redemption or an eerie feeling of bad memories. Playing 12 in the afternoon a day after Thanksgiving wasn’t idea but hey, “no excuses.” The Nets came out lethargic and slow, however they found ways to move the ball and stayed even with the Wolves offensively; only trailing by 6 points at halftime. 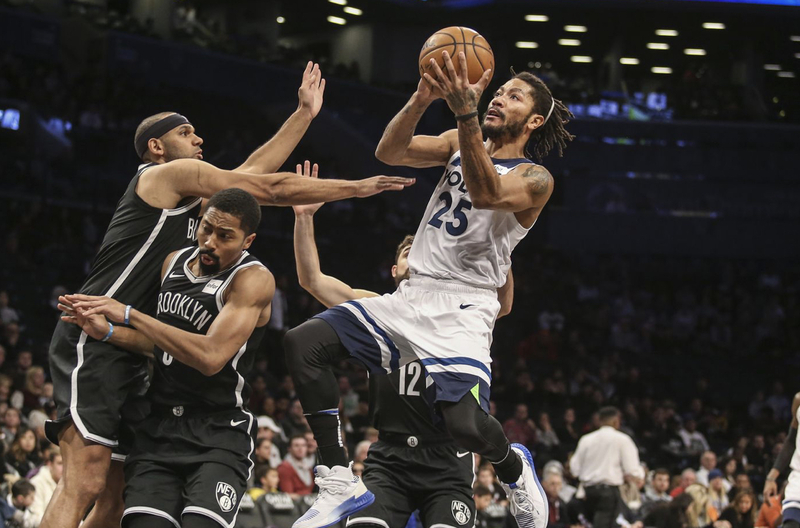 The Timberwolves would close the gap as they outscored the Nets 35-23 in the 3rd quarter, which gave them an 18-point lead. With the 4th quarter underway the Nets looked to gain some ground and close out the game with a win. Spencer Dinwiddie became explosive off the bench as his offense brought the Nets closer late in the 4th. As he knocked down back-to-back free throws, the Nets were within 4 (104-100) with 2 minutes and 38 seconds on the clock. Brooklyn would not recover as Minnesota took an 8-2 run down the stretch; they defeated the Nets 112-102. Back to Back Losses! !- The Nets have now lost two of their last three games. With a loss to the Dallas Mavericks Wednesday night, despite Allan Crabbe’s season high 27 points; Crabbe finished with 11 points against the Wolves which would not be enough to secure a win. Quiet Game for D-Lo! !- D’Angelo Russell finished with a season low 5 points, only making 2 of his 10 shots, and 0-6 from 3. The Fro on the Boards! !- It seems we’ve becomes accustomed to Jarrett Allen’s double-doubles that when it doesn’t happen it seems weird. While he scored 12 points, he didn’t crash the boards as much. Only grabbing 4 rebounds. Off The Bench! !- DeMarre Carroll and Shabazz Napier would contribute meaningful points of the bench, as they combined for 25 points and 13 boards. The Nets will have to find a way to step up offensively in LeVert’ absence. Next they play Joel Embiid and the Philadelphia 76ers Sunday evening.